Extra large applicator pad 5.5" x 4.5" x 1"
The Large Race Stripe Applicator Pad spreads dressing, conditioner, and wax on interiors and exteriors. 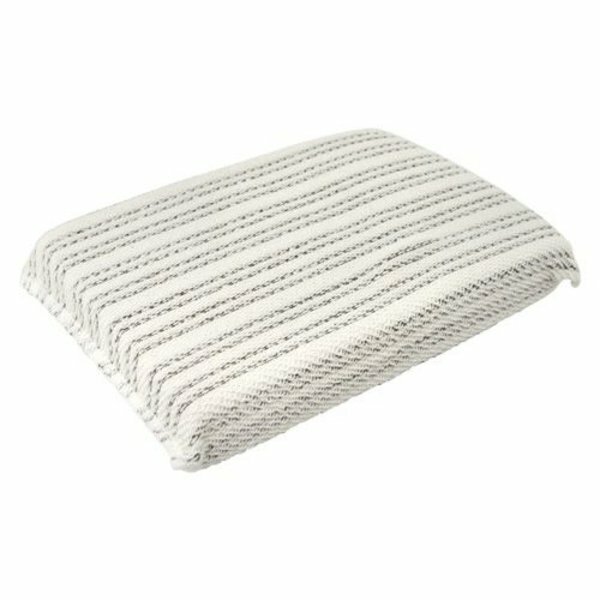 This large applicator pad is made with an easy-to-grip premium poly sponge encased in a durable cotton terry knit weave. The durable weave works great for gentle scrubbing on leather upholstery, vinyl door panels, and plastic dashboards and trim pieces. 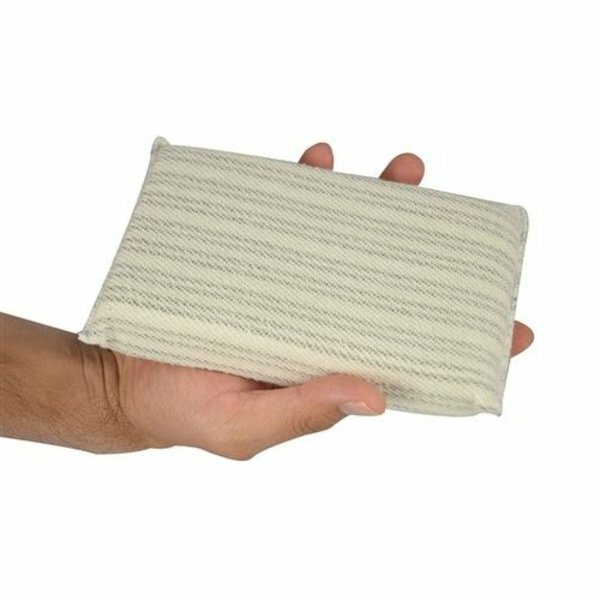 The durable applicator pad absorbs and stores dressings and cleaners after repeated uses, and is machine washable for long life. Use the Large Race Stripe Applicator to spread leather conditioners, leather serums, plastic and rubber shine creams, and even car wax. The light scrubbing action is perfect for gentle leather cleaning, and even for removing bugs, tar, and sap from sensitive car paintwork. Choose the Large Race Stripe Premium Dressing & Conditioner Applicator Pad for focused and accurate application and cleaning jobs inside and outside any vehicle. The Large Race Strip Applicator Pad spreads products evenly and efficiently. The extra large pad is durable for repeated uses and soft for safe applications all over any vehicle. The Race Stripe Applicator is woven from durable terry cloth cotton, and is perfect for gentle scrubbing on leather upholstery, vinyl door panels, and plastic dashboards and trim pieces. The soft scrubbing action removes bug splatter, dried on bird droppings, struck on tree sap, and stubborn road tar without harming paint. The plush applicator pad spreads cream and gel tire shine, plastic dressings, and leather protectants evenly and quickly. The interior poly sponge stores dressings and cleaners for repeated uses, and is machine washable for long term usability. 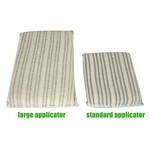 Get two Large Race Stripe Premium Dressing & Conditioner Applicator Pads: one for interior and one for exterior uses. Use one Large Race Stripe Applicator Pad to clean leather and spread conditioners, serums, plastic and rubber shine dressing, and the other one to scrub bugs off bumpers and spread wax. The Race Stripe Applicator is perfect for spreading tire shine on normal and low-profile tires on any car, SUV, or truck. Choose the Large Race Stripe Applicator Pad for any interior or exterior dressing and protectant applications. Leather and paint are sensitive to improper cleaning. The Large Race Stripe Premium Dressing & Conditioner Applicator Pad is perfect for cleaning sensitive surfaces. The soft scrubbing action is perfect for cleaning dirt, bugs, tar, and grease from leather upholstery, motorcycle gear, and exterior paint. The premium terry cloth cotton and scrubbing weave is tough enough to remove dirt, grease, and grime from leather and bugs from paintwork, but soft enough to not scratch, mar, or damage the surface while cleaning. Use the Large Race Stripe Applicator Pad to clean sensitive natural leather seats, steering wheels, door panels, luggage, motorcycle jackets and suits, fine purses, wallets, boots, shoes, and more. Flip the cleaning-pad over and spread your favorite Chemical Guys leather conditioner or serum into the leather goods to restore and protect them against the elements. Bug guts, tree sap, bird droppings, and tar are ugly and unsightly, but they can also damage paintwork permanently without prompt removal. Use the Race Stripe Applicator Pad to gently scrub stuck-on bugs, bird droppings, and fresh sap and road tar with your favorite Chemical Guys bug and tar remover, quick detail spray, or all-purpose cleaner. Flip to a clean side and spread your favorite Chemical Guys sealant or wax over the cleaned area to protect against future contamination and damage. Chemical Guys is the innovative leader in car care products and accessories. Choose the right applicator for the right job for the best results. The Large Race Stripe Applicator is ideal for repeated usage of your favorite Chemical Guys leather conditioner, tire shine dressing, and rubber or plastic trim protectant. Use the Race Stripe Applicator for gentle cleaning on leather and vinyl upholstery, apparel, and accessories like seats, fine bags, shoes, and more. The Race Stripe Applicator even cleans stuck on bugs and bird droppings from exterior paintwork, glass, and plastic without damaging the surface or causing scratches or swirls. Easily scrub leather, vinyl, rubber, plastic, paintwork, and glass with the gentle cleaning powers of the Large Race Stripe Applicator Pad. Always start with the least-aggressive cleaning products and methods before busting out the big guns: choose the Large Race Stripe Applicator Pad for gentle cleaning and dressing applications inside and outside any vehicle. 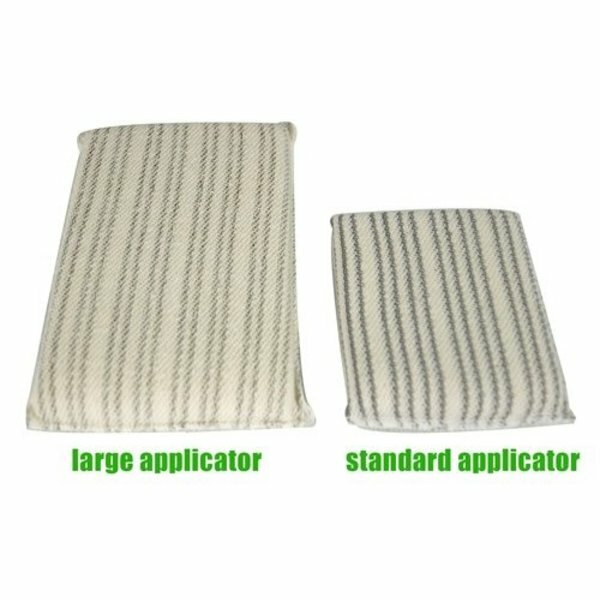 Care for cloth applicator pads the same way as premium microfiber towels. Clean and soft applicators prevent scratches on leather, plastic, and paint. Use Chemical Guys Microfiber Wash to keep your microfiber and cloth applicators and towels clean, soft, and absorbent! Microfiber Wash Cleaning Detergent Concentrate. If used regularly, Microfiber Wash will retain and restore microfiber softness and protect your microfiber towels keeping them soft and absorbent. Separate applicators and towels by type into designated wash & dry loads. Keep grimy pieces separate from cleaner paint and leather ones. Start by washing “cleaner” applicators and towels first, then finish with “grimier” ones. Machine wash cloth and microfiber goods with Chemical Guys Microfiber Wash and HOT water. Machine dry cloth and microfiber goods on LOW heat.